The report suggests that applying business start-up financing models, such as the community microfinance, venture capital or development bonds, could help preserve and protect the Israel’s thousands of archaeological sites and provide local and national economic growth. Community microfinance, building on the example of Lawrence Coben’s Sustainable Preservation Initiative, could help local communities leverage loans, philanthropic donations and direct equity to finance targeted development. 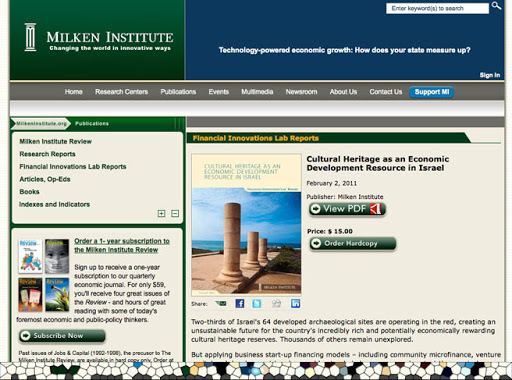 Israel’s tremendously successful venture capital market is a valuable source of potential funding for culture heritage cluster development, linking archaeological preservation with the tourism, small business, retail and even technology sectors. Relatively low-risk archaeological development bonds provide long-term project financing for preservation and can be funded by a variety of revenue streams, including antiquity leasing, media content and intellectual property and even artisan craft and replica merchandise.